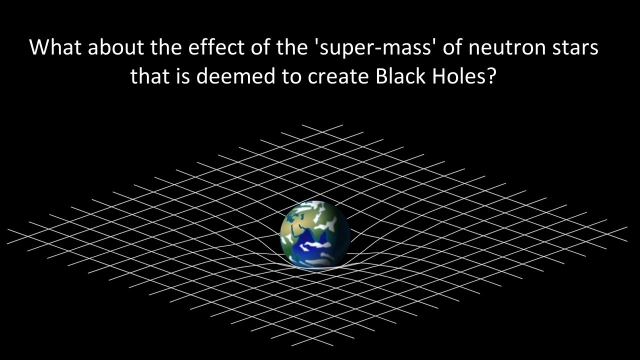 What about the effect of the 'super-mass' of neutron stars that is deemed to create Black Holes? 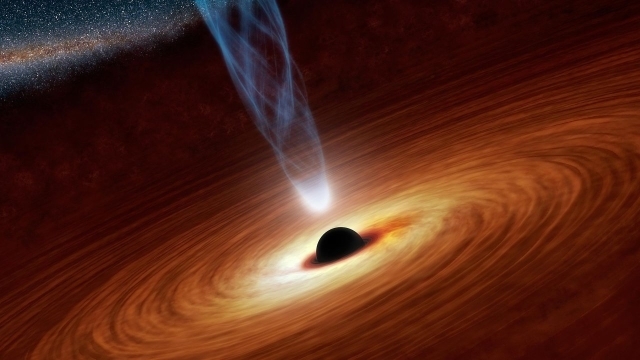 It makes no sense to even dream of Black_Holes neutron stars, forged in stellar explosions. It is known or knowable, that stars, which are spheres of plasma, cannot explode. 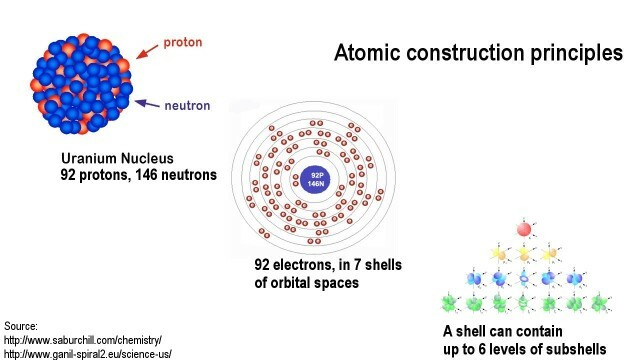 It is further known or knowable that free neutrons are not able to exist that would forge the neutron stars; that only electrons and protons exist as free basic particles. Neutrons cannot exist outside the atomic nucleus in which they are created. 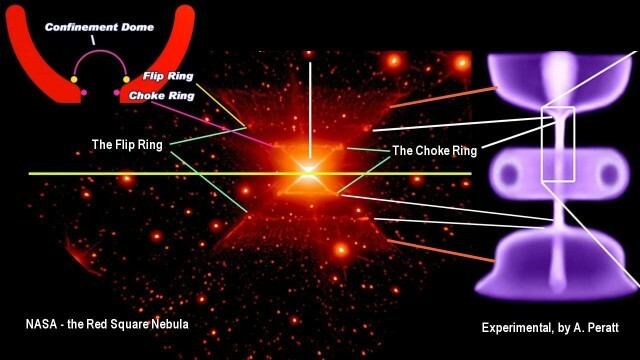 Neutron stars are a paradox. Neutrons are created by the energetic transformation of protons in the environment of an atomic nucleus. When neutrons are split off from the atomic nucleus in which they are created, which happens massively in nuclear power reactors, the separated neutrons quickly decay back to being protons. With this the entire theory of the black holes falls apart. 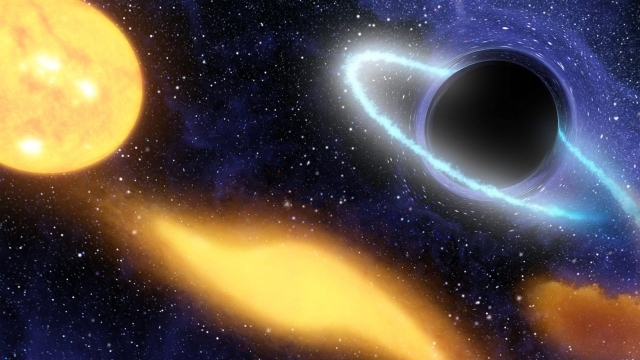 Never-the-less, the impossible story of the black holes continues. 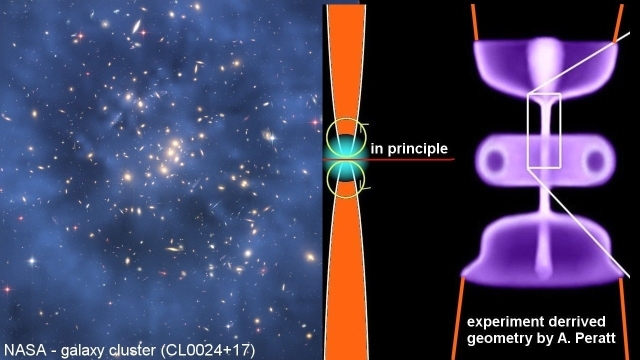 The theory continues because, whether neutron stars are possible or not, a number of cosmic theories require large concentrations of mass to rationalize concepts that are naturally impossible, such as the concept of galaxies made up gravitationally-bound orbiting stars. For exotic theories exotic phenomena are needed. 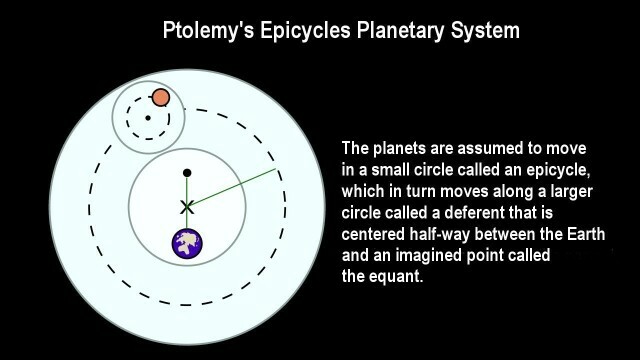 Exotic theories let scientists escape from reality, as Ptolemy had done when he invented in ancient time his theory of epicycles and the equant to rationalize the dream of planets being organized in the heavens in perfect circular orbits. 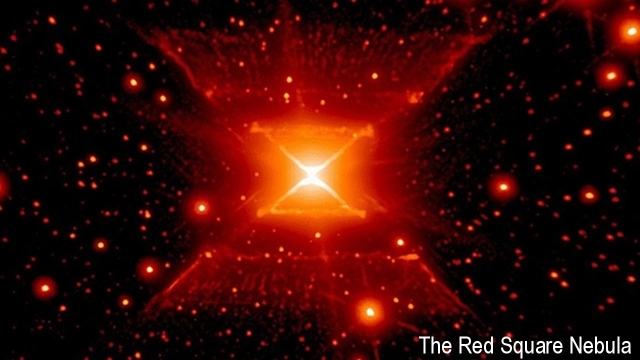 When the neutron-star theory was invented, it was reasoned that neutrons, by being electrically neutral, can become packed together so tightly that a third of the mass of an exploded star will condense by gravity into a tiny sphere of a few kilometers across, retaining in this small space a thi d of the star's original gravity. 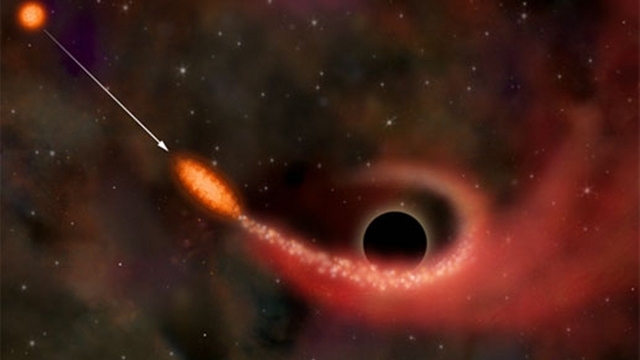 The resulting gravity that a neutron star is deemed to amass is theorized to be so enormous that no light can escape from it, which neutrons cannot emit anyway, and that all surrounding light becomes absorbed by the star's enveloping gravity so that a black sphere appears when seen from the outside. That's another nice dream, isn't it? Exotic tales have been spun around this particular dream. 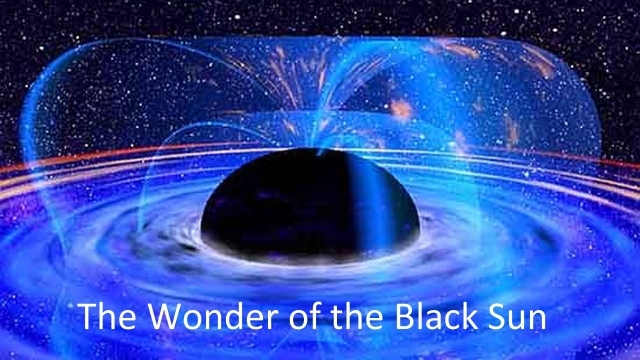 The neutron star is deemed to appear as a black sun on the outside, and the universe is deemed to appear as a black void from the inside of the black sun. But is this really possible? Is this what really happens? 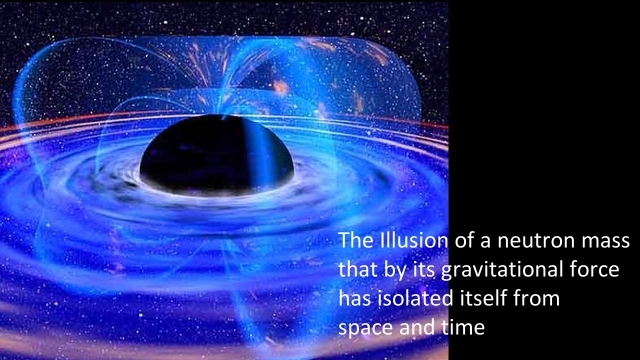 The Illusion of a neutron mass that by its gravitational force has isolated itself from space and time. It should be noted that a neutron star, if it miraculously could exist, would exert only about a third of the gravity of the original gas-star from which it would have been born. The neutron stars' gravitational reach would thereby be rather small in cosmic terms, smaller that of the normal star. But that's not what the theory sees. Its imagines immensely massive gravitational effects that are inherently physically impossible to be caused by gravity. Gravity does not have the electromagnetic properties to affect light, which is electromagnetic radiation. But plasma has been demonstrated to have such an effect, which is erroneously attributed to gravity. Every star is surrounded by a dense sphere of plasma, including our Sun. It is theoretically possible for our Sun to shift the line of sight close to it. The effect is deemed to be caused by the Sun's gravity. But can gravity bend the propagation of light? It is theorized that the effect can be caused indirectly, by gravity affecting the physics of the surrounding space. It has been theorized that the consistency of space becomes bend near a massive object, so that when light becomes propagated thorough the bent space, light becomes bent with it. It is claimed that the effect has been verified for light passing near the Sun. 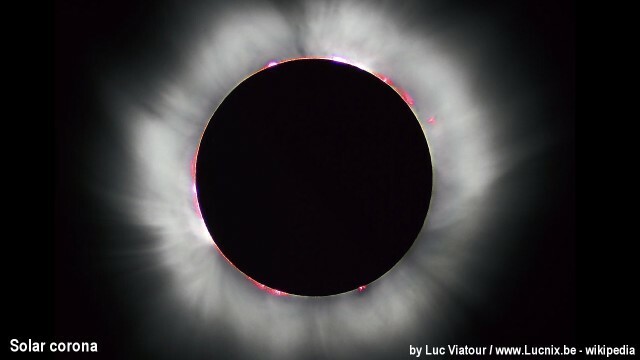 Observations were conducted in 1919, by Arthur Eddington during total eclipse conditions, by observing stars as close to the rim of the Sun as possible. 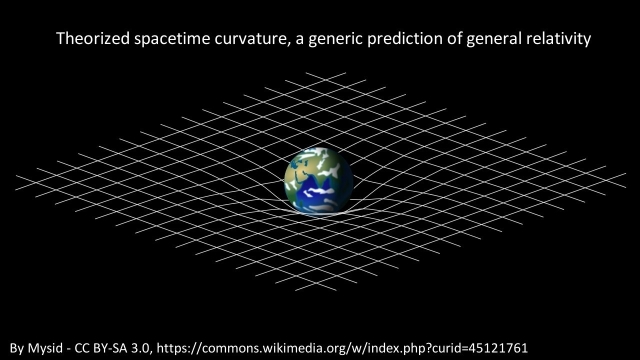 It is believed that the result supports the amount predicted by Einstein's General Relativity theory. But was the effect, as inconclusive as it was, caused by gravity? 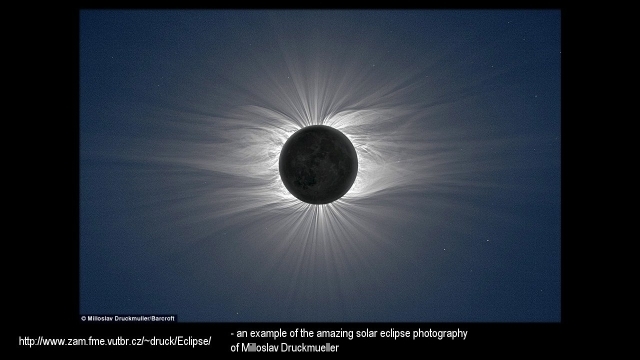 A dense plasma sphere surrounds the Sun that is several times wider than the diameter of the Sun and extends far beyond the visible corona. 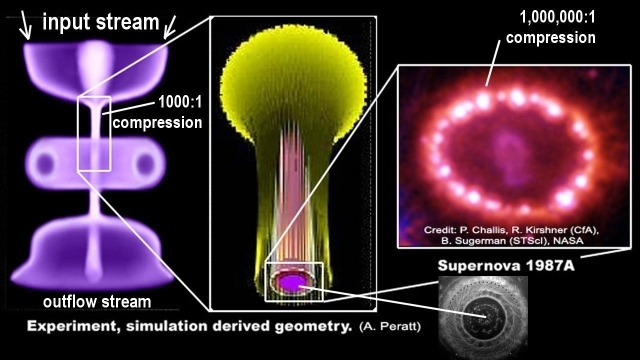 What if the plasma sphere were optical glass, it would most certainly distort the propagation of light. 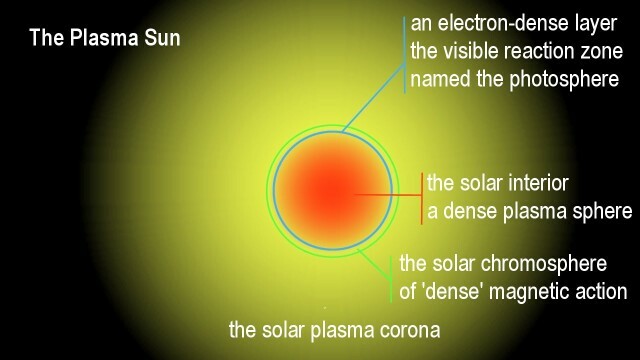 Well, plasma has similar properties, especially near the surface of the Sun where it is also densely packed with ions and atomic elements. 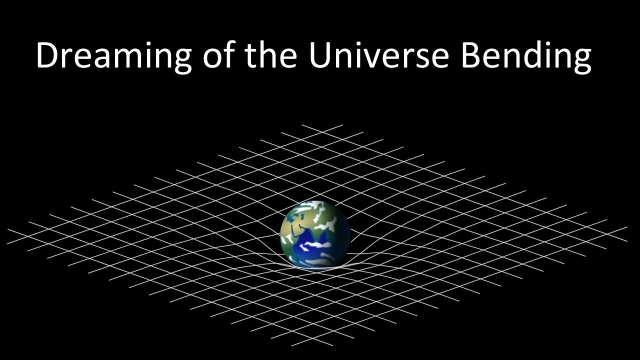 Was the light-bending effect caused by gravity then, as it is claimed, or by plasma? To answer the question it needs to be asked if we have encountered similar effects in space, of light bending around dense plasma objects. 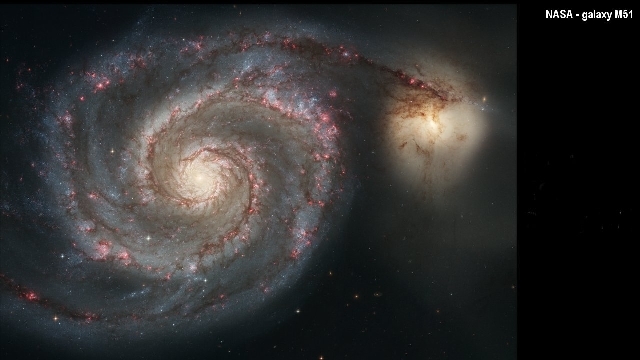 In this image, NASA's Hubble Space Telescope's shows a lensing effect, which is deemed to be caused by gravity. 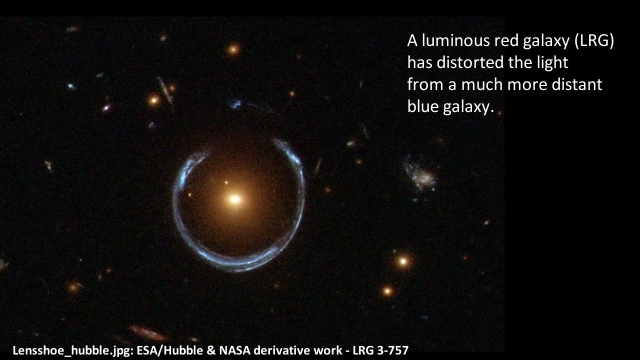 We see a luminous red galaxy distorting the light from a much more distant blue galaxy, whose image is distorted in to a ring around the red galaxy. What we see here is not simulated. 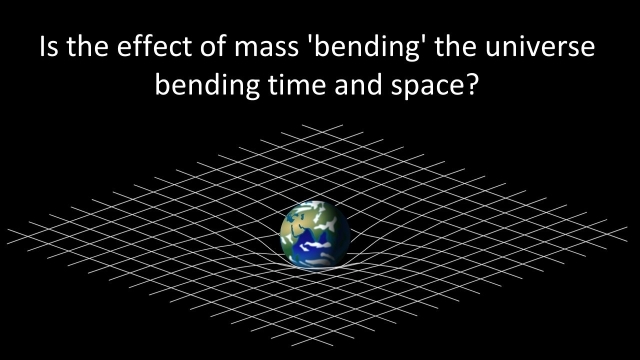 But is it a gravitational affect, as it is regarded in mainstream science? What we see here is extremely unlikely to be a gravitational effect. 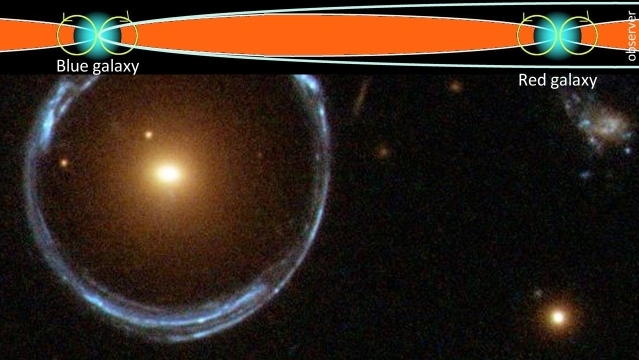 It is far more likely that the we are looking down the axis of an inter-galactic plasma stream, which powers the red galaxy in the foreground and is linked to the blue galaxy behind it, so that it is the intergalactic plasma stream that channels the photons of light from the blue galaxy around the red galaxy and its plasma halo. Gravity, which is the weakest force in the universe that diminishes with the square of the distance, cannot have the enormous effect shown here, across the galactic distances, reaching far outward from the hub of the galaxy. However, plasma flowing is space, which acts with the electric force that is 39 order of gravity stronger than gravity and is not affected by distance, does affect light with the potential to produce the result that we see. Most likely we see a plasma effect. Plasma is said to be the blood of the universe, hence its name. It exists everywhere in space. It is sad to note that mainstream science pretends that it doesn't exist. Thus, mainstream science erroneously relates all observed cosmic effects to the weakest force of the universe, the force of gravity, which doesn't have far-reaching effects, and ignore the rest that exists. According to researchers at the Los Alamos National Laboratory, more than 99.999% of the mass of the universe exists in the form of plasma, instead of in the form of atomic elements. Both have gravitational effects. While the electric effect of plasma is infinitely greater. 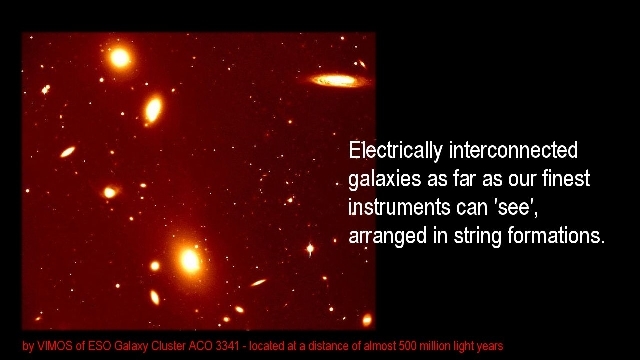 It is reasonable to assume then, that light, which is electromagnetic in nature, can be significantly affected by fields of electrically charged plasma particles in cosmic space on the long path of millions of light years between galaxies. 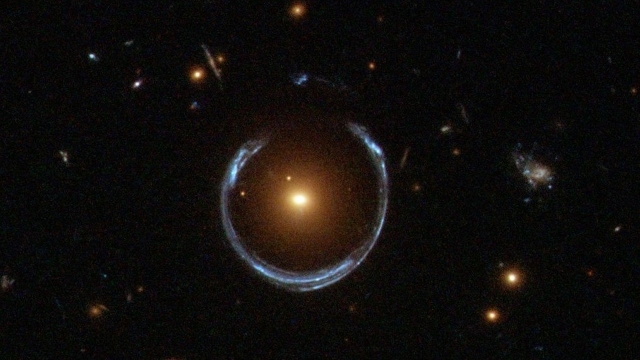 This means that whenever cosmic observations are encountered that appear to be caused by gravitational lensing, the observed effect is far more likely the result of plasma stream lensing. Streams of plasma are streams of the most basic form of mass. They are invisible, but massive. When on looks down the axis of a long plasma stream, as in the image shown here, one can actually observe the principles of large plasma-flow structures evident as they have been observed in laboratory experiments. The principles are strikingly apparent in plasma-flow experiments conducted at the Los Alamos National Laboratory in the USA. Plasma is invisible mass. 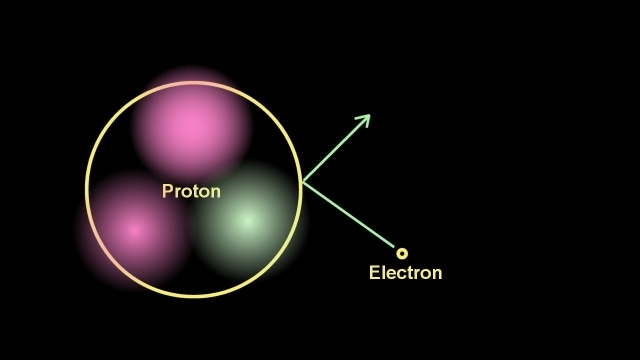 It is mass that one cannot see, because the size of its protons is 100,000 times smaller than the smallest atom, and the size of its electrons is a thousand times smaller again. But the effects are visible of the dynamics of plasma. In laboratory experiment the presence of plasma was made artificially visible by placing atomic in the reaction chambers. When densely concentrated plasma interacts with atomic elements, the atomic elements emit light. By the same principle, the experimental result is also visible in space, which verifies the principle. 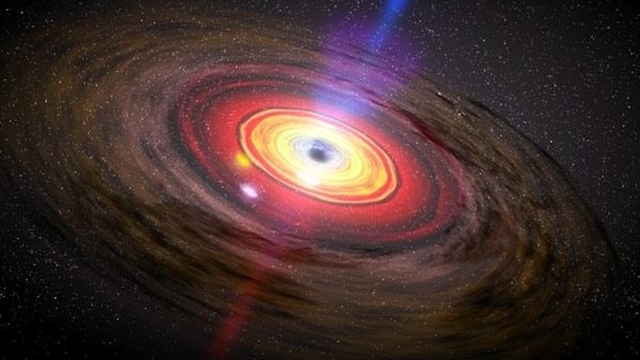 This means that the numerous theorized Black Holes phenomena will one day be correctly recognized to further prove for the Plasma Universe Theory, for which evermore evidence is becoming discovered.